Google has been cleaning up existing buildings in cities across the globe, from San Francisco to Berlin, turning them into colorful work and play environments that are the envy of every cubicle worker. 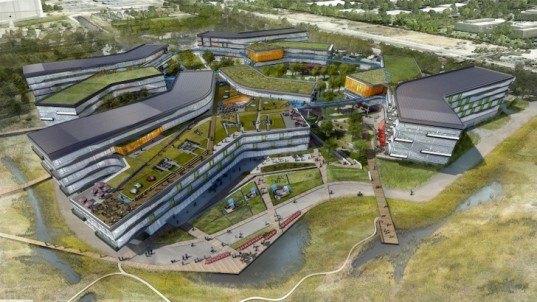 But now the company has unveiled plans to build a structure anew as an extension to their current headquarters in Mountain View, California. The corporate giant gave Vanity Fair the scoop on the green-roofed expansion, which was conceived in collaboration with Seattle-based design firm NBBJ. 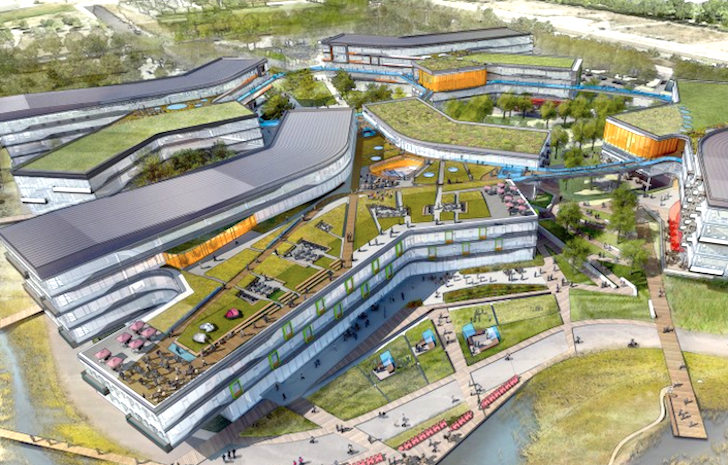 The 1.1 million square foot extension to the existing Googleplex in California will be constructed on an adjacent 42 acre site and will featured nine bent rectangles linked by bridges and a host of verdant courtyards and pathways. The buildings will be up to four storeys high and will be organized in accordance with employee work patterns. In other words, departments that work well together will be near each other, and there will be the usual communal and social spaces that encourage cooperation and creativity. One bridge will lead to a green roof and outdoor cafe and the entire complex will be heated with radiant flooring. This less energy intensive system will be the largest of its kind in the United States. Will Google plant wheat seeds on the roof? Why not? I can see them harvesting wheat year after year to build a seed bank, and donate part of the seeds to schools learning about urban farming.